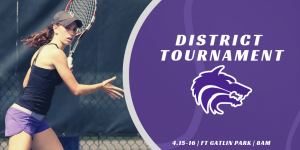 Good luck to Coach Ashby and boys and girls tennis as the teams travel to Ft Gatlin Park to compete in the 2019 4A District Tournament. The tournament is slated to start at 8AM. Go Wolves! Wanna help support the tennis teams this season? We have three ways you can help! We need fans to help take pictures during our tennis meets this season. Please contact Coach Ashby for more details. Be sure to download the Rapid Replay app on your phone and start filming meets. Your video highlights get posted on our website!